It is with mixed feelings and emotions that I sit down to write this report. I promised myself when I started to blog I would share the good and the bad and above be honest and objective so here goes. If you have ever raced you will know what I am about to talk about, but if you haven't well I hope this helps with some perspective. I love to ride and I love to race but it does not come without anxiety and nerves. Am I good enough, will I be on form, can I stay upright and a myriad of other doubts and of course the dire need for many visits to the toilet. Yup racing is the best laxative in the world, just saying. So when you are stuck in a traffic jam with 30 minutes until the race start you can imagine the state of calm that existed within the confines of my car. The plan for the night was the same as last week. Ride both the Master B and Cat 4 events to maximize the racing and race intensity for training. It is hard not to focus on my overall position especially since I was in second place for the Master B series going into the race, but the goal is the long game and so the stage was set. In a point-a-lap race you score 1 point for every lap you cross the line in first with the last lap having 3 - 2 -1 points for the first three riders across the line. As the first race of the night I wanted to warm up so I stayed in the field and did not go out early to contend points. As we neared the end of the race I saw the opportunity to grab a few points. I was however a marked man. The race leader saw me go and using my wheel managed to come around me in the final few meters, I had done enough however to secure 3rd place and open the account for the night. With one race in between I rolled around the warmup circuit and prepared mentally for my next race. Where there were 8 riders in the Master B field there were 22 riders in Cat 4 and the dynamic of the race was very different. Right out the gate the Cat 4 race leader went after points but I sat back with a longer game in mind. Towards the end of the race I saw my opportunity and stole some points in the final sprint doing enough to earn a 3rd place finish. A Miss-n-Out also known as Devil take the hindmost is a race of attrition with the last rider across the line being eliminated from the race until there are 3 riders left. It is a tactical race and this time I got the tactics wrong. One of the rules of track is once you are in the sprinters lane another rider cannot enter it and you cannot leave it. The classic trap in a miss-n-out is to be caught in the sprinters lane and have all the riders come over the top of you. I avoided that trap until 4 laps to go when I was the one trapped. In a Belgian Win-n-Out there are 4 bells in the race a set number of laps apart. On the 1st bell the race is for 4th place, on the 2nd bell the race is for 3rd place, on the 3rd bell the race is for 2nd place and on the final bell the winner takes the race. With 22 hungry riders I settled into the pack and kept a close eye on the race leader who was also hanging back. He is strong and I calculated that he would probably go for the win, either way I had decided to see the race out to the final sprint and stay true to my goal for the night. As we approached the 3rd bell he started to move up the field and then to my surprise attacked, I started to go with him then pulled up as he took off for 2nd place. It was a tactical move but one that was not liked by the rider behind. I slide back in the field as we jostled for position. 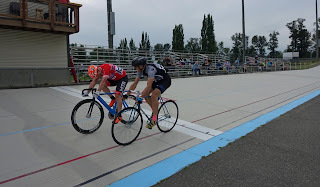 At the final bell I locked onto a wheel and he took off after the win but I was glued in place and as we came around the final bend I put the hammer down and was able to out sprint him to the line to take the race. The final Master B race for the evening. A straight forward scratch race with one $10 preme. We rolled out and from the start the race was one of tactics over speed with no one wanting to put too much work in. At the bell for the preme I was in a good position and thought way not have a dig. It worked out and I scored $10 after which I settled back into the pack. As we approached the final laps the pack moved to the top of the track with everyone on the barrier, you could feel the tension and the energy around you as everyone was waiting for the bell. At the bell a rider went long and I came in on his wheel, it was a horrible position to be in as I knew everyone was lining up behind me. The attack came into the 3rd corner and I accelerated to stay with the field as we came out of the last corner I was laying down everything I had and the finish had shrunk to a single point that I intended to get to first. I took the lead just as we hit the finishing line taking the win or so I thought. As we rolled out I was first congratulated by the second place rider then three riders in turn rebuked me for not holding my line. I will be honest I was confused as I had not thought I had deviated from my line but these are good riders and I will always take feedback and be the first to put my hand up and accept responsibility for my actions. What I did not know was the level of complaint made which resulted in me being relegated for dangerous riding to the back of the field. I had no time to dwell on the previous race as I rolled up for the last race of the night. I was tired but fully intended to dig in and have a go as it was my last race of the night. As we dropped in it was clear that this would be a very different race than the Master B. I sat back in the field and watched the action not taking part in the premes and not chasing down a lone break. As we hit the bell I was not in an ideal position sitting around 10th and was forced to accelerate to catch the leaders, I closed the gap on the back straight and went wide in an attempt to come around them. I ran out of track and finished in the top group. It was great to find out that a friend had won. My result is pending. Coming off the track I was greeted by a very confused and angry Sarah. She did not understand why I had been relegated and she encouraged me to find out more. I approached the judges to ask for feedback and was greeted by my second surprise of the evening, I was told curtly that I had been relegated for dangerous riding out of line. What I wanted was to understand was exactly what had been seen but the attitude I was greeted with left no room for questions. I really appreciate judges and their efforts to keep everyone safe, what I really dislike is when it is delivered in an officious and disrespectful way, it simply creates the wrong energy. That by the way goes for riders too. I totally get that they have to deal with riders with attitude but it is not like we were racing for big money or the world championship. Whilst it was disappointing to lose the points, it was not the end of the world and I personally had gotten what I needed out of the effort. I accept the feedback of my fellow riders and will take it to heart so as not put others at risk as I would not want to be put at risk. The sad thing is that the whole incident left a bad feeling in the air and Sarah and I left on a downer which is not how I want to feel about a sport I love and I certainly don't want to have bad feelings with those that I choose to spend my time with. I shared the events with my coach and now with you. What is past is past and I will look forward to my next evening of racing with renewed energy, lessons learnt, oh and front and back cameras so I can review my racing lines in the future. We have found that the Osymertic dual cam rings give us a performance gain. We started using them in 2012 when Wiggins won the Tour with Team Sky. since then Froome has won it twice and the Critérium du Dauphiné, including this year three times. I would be glad to send you a pair to try, they work!!! That is really funny, I was just looking at those a couple of weeks ago and I am definitely curious and would be interested in trying them out. Sorry I didn't get back to you sooner, didn't click (Notify me). I'll be glad to help. Call me at 786 307 5986 or email at wbarrere@gmail.com.